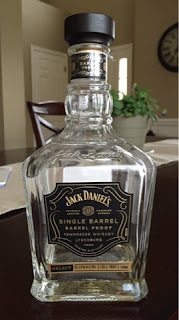 I couldn't help but notice the high praise going around for Jack Daniel's single barrel barrel proof whiskey, and, while I tend not to gravitate toward Jack Daniel's products, I felt I owed it to myself to give this one a try and see for myself if it's worth of the praise that it has been receiving. The nose is distinctly charcoal, a characteristic that is somewhat unique to Jack Daniel's. The aroma of pipe tobacco seemed to come through later, along with the scents of burnt sugar and plum. I don't know what exactly I expected, but it certainly wasn't a blend such as this, and it certainly had me eager to try that first pour. That first pour was not what I was expecting given the nose, however. Rather, I notice a mix of vanilla and walnut, with some maple syrup to sweeten it up. On the finish were cloves to kick in a little spice and even more vanilla. I found myself really enjoying this at the start. I also noticed that banana flavor that many people get from Jack Daniel's products, but this was relatively slight compared to the other bold flavors. As I worked my way through the bottle, however, I found myself enjoying it less. The charcoal flavor that I was expecting finally showed up and seemed to take over the party, and by the end, it was almost impossible to get beyond it. It remained sweet throughout (and I actually enjoyed it paired with Peanut Butter M&Ms, for what it's worth), but the flavors that I found enjoyable to start seemed to dissipate as I worked my way to the bottom of the bottle. In the end, I was a bit disappointed in this. It started out with so much flavor and promise but gradually became one-dimensional and disappointing.